May’s San Diego real estate market in review: As of May 2018, the median detached home in San Diego County sold for $625,000 up 7.8% from the previous year. As of May 2018, the median attached home (including condos, townhomes, and twinhomes in San Diego County sold for $411,500, up 6.9% from last year. As of May 2018, the average seller of a detached home in San Diego County receives 97.6% of the original list price at the close of the sale. As of May 2018, the owners of attached properties (condos, twinhomes, and townhomes) retained 98.6% of the original list price. We have discovered that the best way to sell a San Diego house quickly and for the best price is to turn it into a home. We have aligned ourselves with the best in the business to do whatever it takes to prepare a house for sale and turn it into a buyer’s dream home. Whether it’s painting, replacing carpet or flooring, landscaping,cosmetic repairs, or staging, we know what to do to prepare your home to shine. The House 2 Home Program was created as a way to showcase these seller services. Whether you’re currently still living in a home or are selling a vacant property, we will be happy to discuss our plan to prepare your home for the San Diego Market. What We Did: We painted walls, painted cabinets, installed new flooring, carpet, lighting and counter tops. We then staged the house, and took professional photos. June's San Diego real estate market in review: As of June 2018, the median detached home in San Diego County sold for $629,000 up 7.5% from the previous year. As of June 2018, the median attached home (including condos, townhomes, and twinhomes in San Diego County sold for $413,000, up 6.7% from last year. As of June 2018, the average seller of a detached home in San Diego County receives 97.6% of the original list price at the close of the sale. As of June 2018, the owners of attached properties (condos, twinhomes, and townhomes) retained 98.5% of the original list price. Thank you for all your support, here are some of the houses Coastal Premier Properties has helped clients buy or sell throughout the county this month. If we can help you or someone you know with making a move, please contact us! Dramatic, panoramic view home in Hidden Valley. Spacious, open floor plan with vaulted ceilings, travertine floors, and wall to wall glass opens onto large view deck. Single level home of exceptional construction, meticulously maintained. 3 bedrooms, plus office, 2.5 baths, fireplace, laundry room and attached garage. Recessed lighting throughout, two central heating and air conditioning zones, top of the line appliances, and endless, sit down views. Highly desirable neighborhood. Live above the fray! Enjoy panoramic views and unparalleled privacy from this gorgeous 12 acre site located at the end of a cul-de-sac within the guard-gated community of Wildflower Estates. Water, power and sewer are already on site. Plenty of usable area for a grand estate with every amenity, including horses. This was the original homesite chosen by the owners of all the land that now makes up Wildflower Estates. Old structures are demolished and studies are available. Premier site, ready to build your dream estate. 8257 The Landing Way is an exceptional residence on a half acre lot in the exclusive, gated community of the Lakes above Rancho Santa Fe. The elevated site commands expansive views east and west, and enjoys spectacular sunsets from the resort like backyard. In model condition, main residence offers superb accommodation with formal living/dining room, climate controlled wine cellar, paneled, executive office with separate entrance, fully equipped gourmet kitchen complete with large walk in pantry. Olivenhain estate w/gated entry situated on 2.32 acres. Neutral décor, 5 bedrooms/2 down, plus office/bonus room & upstairs loft. Large kitchen w/breakfast room including built-in buffet, stainless appliances, stunning staircase w/custom iron banister. Lovely master suite w/huge closet, lavish bathroom & fireplace. 4 car garage, pebble tech pool w/beach entry, spa, fire-pit, putting green, & regulation sized tennis court! Nearby trails, views, top rated schools & so much more! Sold for $2,180,000. Highly desirable Derby Hill plan 2 situated on a premium canyon view cul-de-sac lot just under 11,000sq.ft! Immaculate condition with neutral tones through-out, lovely plantation shutters, gourmet Kitchen with large center island open to family room, bedroom & 1 ½ baths on main floor, beautiful master suite w/ large balcony to take in the stunning views, 3 additional upstairs bedrooms plus loft and upstairs laundry. All this plus owned solar that will reduce bills & great south CV location close to all! 4 Bedroom, plus 2 optional rooms, plus an office! There are so many special features that must be seen- book lover’s niche, designated office space, extra room being used as a pool/game room but could be a bedroom, homework room with built in desks and cabinets could also be another bedroom. The garage has built in storage making organizing easy and a walk in closet that is one of the finest in Carmel Valley. This home features upgrades throughout and has been meticulously maintained. Sold for $1,652,000. Beautiful Belmont Plan 1. Oversized 8,335 SF canyon rim lot with panoramic southern views! 5BR/3BA, 2,756 SF with bedroom/bath downstairs. High-end finishes including hardwood floors, travertine, and remodeled gourmet kitchen. Large grassy front yard, side yard with putting green and backyard with an inviting pool & jacuzzi. Spacious upstairs master suite with canyon views. Quiet location, close to Sage Canyon Elementary, Carmel Valley Middle School, Canyon Crest Academy and Torrey Pines High School. Sold for $1,495,000. Belmont Plan 3 on rarely available, coveted 13,198 SF lot! w/ entertainer’s dream backyard incl: privacy; pool (solar heated) w/ slide; oversize spa; palapa hut kitchen/built-in BBQ & fire pit. Tucked away on a culdesac, this inviting family home offers a spacious floor plan incl: 5 bedrooms (one bed/full bath down w/ murphy bed); gourmet chef’s kitchen; large loft w/ built-in desks; private turret office & 3 car garage. Close to Carmel Valley’s top schools, beaches, amenities & freeways. Sold for $1,486,500. Experience coastal living in your custom built home with gorgeous ocean views! Built from the ground up in 2015, this home features an intuitive reverse floor plan. The bedrooms are on the entry level, with the bright, open great room on the upper level, maximizing the beautiful panoramic ocean views. Off the great room is the spacious patio perfect for entertaining & relaxing alike. The sleek custom kitchen is loaded with all the bells & whistles. Situated on a large 9,300 Sq Ft lot, zoned for 2 units! Truly the STAR of the Shores! 3504sq ft. 5bedroom 4.5 bath. Two additions give the feel of a custom design. Perfectly located on private cul-de-sac in highly desired Torrey Hills community. UPGRADES GALORE! Two OWNED Solar Systems. Full bedroom and bath on the first level. Pool/Spa. Water wall feature with outdoor kitchen.Close proximity to Torrey Hills elementary and park. Sold for $1,425,000. First time on the market & move in ready! Large open floorplan including a downstairs bed/bath suite & large bonus room which could be a 5th BR/office/media room, this home is perfect for growing families. The gorgeous, resort-like backyard features a solar heated saltwater pool, hot tub, firepit & putting green. Kitchen and baths upgraded with quartz counters, new light fixtures, new flooring throughout! Great corner lot with privacy from neighbors and room to relax and entertain! Sold for $1,250,000. Hooray (and hurry!) Think sunset views and sunrise strolls. Confidently sat atop one of Del Sur’s most-sought-after streets, you’ll find this western perched stone clad Sentinel. Nestled next to an easement offering privacy, this modern Farmhouse feels just as much like a zen retreat as it does “home”…Inside is bright, awash in natural light and hardwood floors provide an effortless warmth. Our favorites: main floor master with huge walk-in closet, completely updated throughout and dreamy sunsets. Rarely available canyon lot home in gated community of San Raphael in Carmel Valley. Situated on a premier lot, this home is surrounded by nature & tranquility. Large, private yard backs open space offering abundant natural light, inviting breezes, plenty of room to entertain and a dedicated vegetable garden. This plan 3 offers over 2,700 SF with 4 beds/2.5 baths with access to community pool, spa, tot lot & hiking trails just outside your door. Easy access to freeways & amenities. Award-winning schools. Enjoy San Diego Paradise and the World Famous Little Italy lifestyle. This stunning SW corner 10th floor 2 bedroom penthouse, boasting panoramic, breathtaking bay & city views, will impress & dazzle you. 2 level urban design, walls of windows, & 12′ ceilings. Popular floor plan features 2 balconies, separate dining area & walk in closets. Custom kitchen with peninsula island. High end finishes include Sub-Zero & stainless steel appliances, granite countertops and diagonal set wood floors. Built in 2015, this lovely home sits on a prime corner lot in the center of the highly desirable community of Canterra at Pacific Highlands Ranch! Featuring a light and bright open floor plan, main floor bed and full bath, an upgraded kitchen with granite countertops with large island. Upstairs features a convenient laundry room, large loft, two bedrooms, dual-sink bathroom, and a generous master suite with separate soaking tub, shower, and walk-in closet. Plus private patio for outdoor entertaining. Large family home in beautiful Tierrasanta. This home has been extensively remodeled with fantastic upgrades throughout. The kitchen boasts high end Viking and Fisher&Pakel appliances. Large granite counters with extensive seating. Fireplace in master bedroom, family room, and living room. Master bedroom has large walk-in closet. Custom wrought iron railings. Wood and carpet flooring throughout. Too many features to list. Welcome home to this move-in ready executive family home in highly sought after Rancho Arbolitos! Remodeled gourmet kitchen includes high end SS appliances, granite counters, prep island, walk in pantry. Enjoy entertaining in the large resort backyard w pool, firepit, built in BBQ. Beautifully upgraded with hardwood floors, plantation shutters, gorgeous lighting, & custom wood garage doors. Situated on a large private lot close to schools, parks, shopping & freeways. Arabella Plan 2, beautifully upgraded home w/southern exposure! 4bd, 3 full baths, bedroom on 1st floor, hardwood floors, open kitchen complete with S/S appliances & new cook top, upgraded lighting, fireplace in family room, built in speakers & plantation shutters. Gorgeous landscaping with covered patio & new water heater. Amazing location close to schools & shopping with walk-score of 4.5 out of 5. All this plus lovely PHR community center with pool, gym & more! Beautiful Contemporary, renovated Viola Model, 2 Bed 2 Bath w/ optional 3 Bed. Completely remodeled kitchen and dining area w/ custom cabinetry and top of the line appliances. Beautiful wood flooring and gallery lighting throughout, spacious loft area upstairs, an open master bath with large soaking tub. Plenty of storage, garage cabinets. All new copper plumbing. Shows like a Model Home. Beautifully remodeled single story with 3 BR, 3 full BA w/ private gated entrance. Features hardwood floors, crown molding, upgraded baseboards, dual pane windows, newer HVAC and owned solar panels. Spacious gourmet kitchen w large granite breakfast island, SS appliances & 6 burner stovetop. Huge .63 acre yard for kids to play, horses or gardening. Enjoy entertaining on the lovely paver patio w wood burning fireplace & pool. Country living at its finest but close to shopping, schools & parks! Lovingly maintained by long time owner, this one is special. Only 2 blocks to Balboa Park. Spend summer days chatting on the front porch, or sip tea by the fireplace in the living room. Gleaming hardwood floors lead to a formal dining room with a built-in china cabinet. French doors open to a charming sun room. The kitchen harkens back to the 1920’s with its vintage tile. Large family room has wood beam ceiling and lots of windows. The spacious lot has generous lawns, two garages and RV parking. This upgraded 3 bedroom 2.5 bath townhome is in most sought after Highlands Village with bright and open floor plan. Handcrafted maple hardwood flooring throughout the house. Gourmet Kitchen with granite counter top. The enormous master bedroom has walk-in closet and additional closet. Master bath has double sinks , soaking tub and shower. Two more bedrooms and laundry room upstairs. Attached 2 car garages. Move-in ready. Resort-style living with pool, clubhouse etc. Top rated school district. Location Location and Peek-a-boo Ocean View!Highly desired Del Mar Location, across the street from Torrey Pines State Beach. This home is in Sea Village, a lovely quiet neighborhood with lots of ocean views! This home appraised at $875K in October 2016. Home was gutted and prepared for remodel but due to family emergency now has to be sold. There was $9500 of wood repair done in January 2017, as well as property completely demo’d and is ready for all new finishes. Sold for $830,000. Stunning Home on Half Acre Lot w/ Views! Gourmet kitchen w/ rich stained cabinetry, granite counters, center eat-at island, stainless appliances, built-in desk & flows seamlessly into dining area & cozy den w/ fireplace. Huge great room has fireplace w/ custom barn wood mantle, decorative reclaimed shiplap wall, vaulted ceiling, & leads you to backyard with spacious patio, large grass area, play structure, & side yard w/ double gates perfect for RV parking. Downstairs bed w/ full bath. Back on market! No fault of home. Beautiful and impeccably maintained corner lot property with gorgeous pool. Upgrades include kitchen island, granite backsplash, stainless steel appliances, walk-in pantry, dual A/C and heating on SOLAR. Newer tile floors in all three bathrooms. Four bedrooms PLUS main floor office with Murphy Bed PLUS master retreat could easily be additional bedroom. Premium lot. Expansive deck off master bedroom. 3 car garage. Low heating/cooling costs. Solar contract transfers. Beautiful upgraded SINGLE STORY home. Wood floors throughout, upgraded kitchen, crown molding, and high quality double pane windows. Front yard is full of maintenance-free year-round flowering drought tolerant landscaping. Backyard has multiple varieties of fruit trees and great views of the mountains. Very quiet location close to freeways 56 & 15 and PQ Town Center. Poway school district. Check out the 3D Virtual Tour. Sold for $730,000. Beautiful 4-bedroom, 3 bath San Elijo Hills home! Nestled in the highly sought after gated community of Belmont, this home is move in ready! Step inside the welcoming and airy open floor plan featuring gorgeous porcelain tiles and a spacious Great Room! A first-floor bedroom with bath makes a perfect room for guests or visiting relatives. Plenty of windows provide natural light. The lovely, low-maintenance backyard with travertine pavers, features a spacious patio with ledgestone sitting wall. LOCATION, LOCATION, VIEWS & 1/4 ACRE LOT! Stunning Santa Fe Hills home nestled at the end of a cul-de-sac on LARGE lot w/ OCEAN & SUNSET VIEWS! 4 Bd+LOFT & 3 full baths (incl. entry level Bd w/ full Ba) + beautiful upgrades incl. hardwood & tile flooring, plantation shutters, custom paint, crown moulding, ceiling fans & more! Amazing views from the large rear yard w/spacious patio, putting green & raised deck w/spa to enjoy the beautiful ocean/sunset views, make this your entertainers’ dream home! Lovely, updated two bedroom and two bathroom home with added optional third bedroom (office/sunroom) with a mountain view. 55+ Seven Oaks living in desireable section of the community. Built in 1970, newer home. Remodeled kitchen and bathrooms with granite and stainless steel appliances. Newer, one year old roof. Dual pane windows and sliding doors. Vaulted ceilings and gas fireplace in Living Room. Master Bedroom has sliding door to covered patio. Sold for $675,000. Stunning home is in a great location! Minutes from downtown, the airport, coastal beaches, and numerous shops and restaurants! Only lot in neighborhood with sizable side yard! Located on a quiet cul-de-sac, adjacent to USD college, and near all major freeways! Sold for $665,000. Welcome to this delightful detached home located near the end of a cul de sac! Single level 1294 sq ft with 3 bedrooms + an optional room & 2 full bathrooms. Recently updated with design elements that make the home feel inviting,modern & stylish. Bask in the natural light that comes through the windows. Enjoy cooking in this updated Kitchen with lots of cabinets & lovely granite countertops. Large Master bedroom with a walk in closet & en suite bath. Play,Relax or entertain in this tremendous backyard. Don’t miss out on an amazing Scripps Ranch gem. This 3 bed / 3 bath home is full of upgrades with beautiful recently installed floors, countertops, appliances, and fresh paint throughout. With an amazing location, It is walking distance to school, steps from a large park with a basketball and volleyball court, shopping, restaurants and more. The complex even features a play structure for kids, easy access to the freeway and low HOA dues! Sold for $658,888. Wonderfully upgraded, true end unit, in desirable Triana development just a short walk from highly regarded Dingeman Elem, with huge yard…larger than many detached homes in the area. Upgrades include travertine tile flooring downstairs, new carpet upstairs, custom wood trim, upgraded lighting, updated bathrooms, and kitchen w/ slab granite counters, stainless steel appliances, and recently painted kitchen cabinets w/ custom pulls/knobs. Low HOA fees include community pool/spa. Ideal Investment Property. Carmel Valley 2 bedroom (2 story) townhome with 2.5 bath in Sunstream Complex with vaulted ceilings and natural light throughout. Good size patio for entertaining. Amenities including: 2 pools and spas, tennis courts, 2 saunas, fitness center, and a clubhouse. Water and trash included in HOA. Award Winning Schools, Minutes to shopping, frwy, restaurants, Torrey Pines Hiking trails and beaches, Excellent walk score. Sold for $630,000. Discover Ramona’s desirable West End. Updated home on appx. 2.4 acres with breathtaking views not only in the back yard but also the front. Quiet, private location, natural boulders and usable property make this home a beautiful place to raise your family. Open floor plan with views out every room and large covered back porch. Kitchen has solid surface counters and stainless appliances. Extra room can be office, formal dining or game room plus 4 large bedrooms. Shows like a model home. Highly upgraded home in La Costa Meadowridge! End unit, light & bright, hardwood floors down stairs, granite in kitchen w/travertine backsplash, spa like master suite includes 18″ travertine tile, travertine shower, frameless glass shower enclosure, new vanity w/granite, recessed lighting throughout, crown molding, beautiful open staircase, designer carpet upstairs, newer furnace & A/C, large fenced in rear patio surrounded by a large grassy area. Very quiet & private. Newly renovated single story beauty situated in the hills of Vista. Gorgeous pool & entertaining area w/ mature tropical landscape & views of surrounding mountains. Gated parking for RV, Boat or Toys! New open kitchen w/ imported Italian flooring, silestone countertops, ss appliances, & modern soft close cabinets. New bathrooms w/ soaking tub & stunning shower w/nicaraguan granada blue tile, brush nickel, and glass sliding barn door. AC & Heat. Oversized garage. Sold for $590,000. Located on a quiet street with an oversized corner lot. This 3 bed/2 bath home awaits you! Relax in the wide open backyard w/ covered patio. Gated fence allows for RV parking. Highlights include: large kitchen w/ granite countertops & hickory cabinets, newly remodeled bathrooms with granite & tile, AC, dual pane windows, newer roof and gutters, mature fruit trees. Walking distance to the park & renowned Poway Elementary School. Sold for $535,000. This 3 bedroom / 2 bathroom home in Santee features a large private lot with mountain and city views. With 1092 square foot main house, and a finished unpermitted bonus room of 288 sqft (adding living, laundry and possible office/guest room space), this house has a total of 1380 square feet of entertaining and living space. With the open floor plan, upgraded kitchen and custom bar top, this home is ready for family gatherings. Beautiful lower level condo with upgrades including granite counters, stainless appliances, updated bath, double pane vinyl windows and patio doors. Open living areas, large master bedroom/bath/closet, 2 patios, stacked washer/dryer, detached 1 car garage w/opener. Unit is private and backs to greenbelt. Complex includes heated pool/spa. Perfect home or investment property (min. 1 month rental) as a furnished race/summer rental or long term unfurnished. Walking distance to beach, restaurants and shopping. Desirable 2 bedroom unit with 2 car attached garage! End unit that backs to open space with serene park-like & mountain views, very private! Updated kitchen with open floor plan, wood flooring downstairs, ceiling fans & central air. Living room fireplace, downstairs powder room and 2 large bedrooms upstairs w extra storage. Located in award winning Poway Unified School District. Short distance to freeway, schools, parks and neighborhood shopping w/restaurants, entertainment and stores! GORGEOUS renovation done to this 4 Bedroom, 2 Bath home in Encanto. New – Quartz Counter Tops, Wood Laminate Flooring, Stainless Steel Appliances, New Kitchen & Bathroom Cabinets. Close to All! Easy Freeway Access!! Private Yard for Entertaining. Highly desirable single level living & move in ready! Charming 3 br/2ba is perfect for young family or down sizing. Beautiful kitchen w granite counters, tumbled stone backsplash, recessed lighting, center prep island, newer appliances. Cozy living room w fireplace is a great gathering spot. Features upgraded baths, vaulted ceilings, central A/C & energy efficient Milgard windows. Great corner lot location w an extra parking pad for car/boat/small RV on side of home. Sold for $450,000. Welcome to this beautiful Alameda 2 bed/2 bath townhome! Single level, end-unit home w/ great location in the complex. Home offers recently remodeled kitchen with new granite countertops, crown molding, laminate flooring in living, newer windows, newer HVAC system, spacious patio w/ new cover & nice views. Fridge,Washer, Dryer stay! RB Swim & Tennis Club membership included. Complex offers Beautiful Pool, BBQ’s, & MORE. Don’t miss this prime location w/ Prized POWAY school district. Sold for $403,000. Wow! Single Story End Unit In Desirable Escondido Hills In North Escondido! Single Family Attached, Not A Condo Or Townhome! 1 Car Attached Garage With 2 Dedicated Parking Spaces In Front. Open Floor Plan. Vaulted Living Room Ceiling, All Ceilings Re-Textured. Quiet Neighborhood Complete With A Beautiful Community Pool, Playground And Walking Paths. Newer Sliding Door Opens To Nice Sized Private Landscaped Patio With New Slab. Sold for $363,000. Offer accepted prior to MLS entry. Brand new upgrades throughout. This jr-1 bedroom condo nice cabinets w/ granite countertops, dual-pane windows, custom paint, upgraded carpeting, modern sliding doors and crown molding. Easy to access from the parking lot. Within minutes to La Jolla Shores beach, UCSD & shopping centers. Just across the street includes Ralphs, Trader Joe’s, AMC Theater, DSW and more. Quick access to I-5 and SR-52. Thank you for all your support, here are some of the properties Coastal Premier Properties has helped clients buy or sell throughout the county this month. If we can help you or someone you know, please contact us! Stroll to an Alfresco dinner in the village then return to relax in the private courtyard or by the warmth of the fire in this unique and absolutely charming 2 BR/2 BA single level home in the heart of Del Mar. Live and entertain easily here, where design allows for effortless transition from indoor to outdoor spaces. Beautiful vaulted wood beam ceilings and tile flooring. Fireplace in family room with classic brick surround. Kitchen features natural wood cabinetry and granite countertops. Sold for $1,860,000. Beautiful craftsman estate in the sought after neighborhood of “The Ranch” in Carlsbad. A plan 5, including 6 bedrooms (full bed/bath down), 4.5 baths, a spacious family room, formal living & dining room, gourmet kitchen w/ large island, breakfast bar & generous walk-in pantry, a Resort style backyard w/ pool, spa, grassy area, firepit, and swim-up bar w/ built-in BBQ + a pristine 4-car garage and covered carport. Close to award winning OPE, Diegueno, & LCC high schools, parks, trails, and shopping. Rarely available, sough-after floor plan located on desirable cul-de-sac st. Backs to open space/canyon w/no one directly behind you! Open spacious floor plan in impeccable condition, completely remodeled w/stunning upgrades throughout. Located downstairs are a private br & full bath, slightly expanded game/entertainment room & 2 separate powder rms! Lovely yard w/spa & numerous patio areas to enjoy. Private swim & tennis nearby, exclusive to Chantemar residents only. Sold for $1,405,000. Gorgeous single story, move in ready home w/ocean views situated on 10,000sf flat lot! This magnificent HIGHLY UPGRADED modern property boasts 3 bdrms, 2.5 upgraded baths, high ceilings, a wood burning fireplace & hardwood floors. Kitchen is complete w/marble counter tops, subway tile back splash, S/S appliances & OCEAN VIEWS. The backyard is perfect for dining, entertainment & enjoying sunset views. Close to restaurants, beaches & schools~WOW! This one has it all! Fantastic location, Immaculate, large lot & No Mello-Roos! Features; Remodeled kitchen w/induction stove top, convection/mirco, remodeled bathrooms, newer windows/doors, designer touches thru-out, lots of natural light, master on main floor, 3 car garage & much more! Outside enjoy Pool and Spa along w/ large BBQ Island perfect for entertaining! All this plus fantastic west side location, top schools, walk score 4.5 of 5! Situated between the luxury communities of Santaluz and RSF, Santa Monica is an exclusive gated enclave of executive homes. This 5 BR/4.5 BA home is on a pool-size lot, at the end of a cul de sac with no neighbor behind for wonderful privacy. Enjoy panoramic views and privacy from the master BR balcony and the convenience of a downstairs office/bedroom w private bath. Centrally located near freeways, schools, parks, shopping & minutes to world class beaches! Community pool/spa/tennis & more! Top PUSD. Beautiful open-concept floor plan with the perfect yard/pool for the Southern California climate! 2 covered patio/courtyard areas! Beautiful kitchen and large Great Room for all family sizes! Enormous master bedroom and master bathroom! Centrally located in the highly sought-after Torrey Highlands community, this home is located in the award winning Poway Unified School District and is just minutes away from parks and trails! Close to shopping, restaurants, YMCA, grocery stores, and I15 and SR56 freeways! Sold for $1,310,000. 4 + 1 bedrooms with 5 full baths!! One of two largest lots in Torrey Del Mar! Optional main floor bedroom w/full bath would be great for guests, parents, nanny, or home office! Gourmet kitchen with granite counters, raised panel cherry cabinetry, upgraded appliances with built-in refrigerator and chef’s island! Beautifully upgraded flooring throughout including rich ceramic, gleaming hardwood and plush carpet! Rich custom two-tone paint and custom window treatments! Gorgeous 2 on 1 remodeled property in coveted North Park location on Granada Ave. Main house is 2/2 with a den and 1238 sf. Rear unit is 1/1 with an office/optional 2nd bed and 741sf. Seller kept many charming features including original Batchelder fireplace, built-ins, wood trim throughout, yet added sleek finishes like wine fridge and ice maker with minibar making entertaining a breeze. Each unit has in unit laundry hookups, own private fenced yard, and designated parking. It’s March Madness at Portofino by Meritage Homes at Pacific Highlands Ranch in Carmel Valley! * Top School Districts! New Construction! * Built with superb energy efficiency, saving YOU money! * Enjoy the lifestyle awaiting at Pacific Highlands Ranch with pool, playground, trails and park. * Professionally designed with elegant features, gourmet kitchen and master suite with view deck! * Indoor/Outdoor living with flex space. Paid HOA Fees in 2018 for March COE! Located in highly desirable Carmel Valley w/elegant living in one of San Diego’s most active neighborhoods. This 2-story home has beautiful designer upgrades, main floor bedrm & full bathrm, eat-in kitchen & large island perfect for entertaining & extended outdoor living. You will love this homes money saving features w/solar panels, new energy efficient air conditioning & a meticulously designed backyard w/low maintenance drought resistant landscape. It is minutes away from Torrey Pines HS. This home is located in beautiful Carmel Valley, Pacific Highlands Ranch community. Build 2016, 4 bed 3 bath with upstairs loft. Has downstairs guest bedroom with full bath. Fabulous features and upgrades throughout, includes window shutters, extended granite counter top, stainless steel appliances and many more. Great location, close to shopping centers, restaurants, etc. Easy access to freeways (56 & 5) and coastal close. Community is surrounded by San Diego’s award winning school districts. Quality & design reflected in every detail of this luxurious home w/numerous high end designer upgrades throughout! Breathtaking outdoor living space w/pool/spa, waterfalls, boulders, slide, built-in BBQ, fire pit, patio, upper deck w/mountain views, zip line, treehouse, an entertainers paradise! The interior boasts travertine & slate flooring, gourmet kitchen w/granite counters, decorative splash, remodeled bathrooms w/stone counters, gorgeous tile walk-in showers w/decorative accents. Must see newly renovated beauty situated in La Costa in the desirable gated community of Alicante Hills. Elevated location provides amazing panoramic ocean views from living room, back yard and master bedroom w/oversized walk out balcony. Open floor plan w/radiant natural light giving the home a relaxed ambiance. Only one neighbor and opens to green space. Chefs kitchen w/SS appliances. Fresh paint inside/outside, new windows & new carpet. Wonderful home in the desirable neighborhood of Torrey Del Mar. Bright and light with south facing private xeriscape yard, with bonus studio room and a short walk to a beautiful community park. Features include 10 ft. ceilings with crown molding, lots of light and windows, large open plan kitchen with granite counters, maplewood cabinetry and island sink. The large family room has custom wood and granite fireplace mantel. Wood floors throughout, stone tile master bath with all glass shower enclosure. Located in prestigious Stonebridge Estates, this wonderful floor plan features a large main living space, huge master suite with sitting area, separate living and dining rooms, and a spacious downstairs bedroom. Quality upgrades include custom paint throughout, hardwood laminate floors downstairs, hardwood floors upstairs through the master suite, and brand new Berber carpet in all other bedrooms. Kitchen includes cherry stained cabinetry, SS appliances, and pantry. Located on a corner lot, in the highly desirable Villa Vista development, this rarely available single level home features a unique floor plan and a huge, usable back yard. The wonderful floor plan includes vaulted ceilings in most rooms, two main living areas, a separate dining room, 3 spacious bedrooms plus an office/sitting room off the master bedroom, and a truly unique conversation pit to gather near the fireplace. Quaint and private single story ranch on nearly an acre of flat all usable lot. This light and bright turn key beauty boasts an open concept layout with designer finishes and vaulted plank ceilings. Brand new cool roof, 5ton 97% efficient furnace & top of the line tankless water heater. Wood tile flooring, freshly painted, recessed lights throughout! Massive yard for horses, RV, trailer, boat, pool, etc. NO HOA or Mello-Roos. Zoned R-2: plenty of space to build another home. Top Ranking Poway Schools! Largest floorplan in the Meadowood community. This beautifully maintained home has 4 bedrooms, & 2 baths upstairs and a den/office & full bath downstairs. Oak hardwood floors throughout most of the home. Kitchen has all newer SS appliances, granite counters & eat-at counter. Pool-sized backyard with built-in BBQ island, patio with pergola, gazebo, Koi pond, & fruit trees. Neighborhood amenities include pool, spa, clubhouse, playground, basketball courts, & walking trails. Top rated schools. This Sunny, West Facing, Spring Canyon Plan 4, the largest floor plan in subdivision, has been nicely upgraded with custom paint, wood/tile flooring, wood plantation shutters and custom fabric window treatments. Master Bathroom is gorgeous with travertine floors and marble vanity. Perfect home for entertaining with its bright white open kitchen with island and over sized yard with mature landscaping. 2 car attached garage with 2 additional driveway parking spots and plenty of guest parking on the street. Lovely, 3-on-1 property with a single family house in front and 2 additional units in the back. All units are 2br/1ba. All units have a single car attached garage. Laundry facilities on site. These units have been remodeled, including a recent complete remodel of the front house. New windows, new (or newer) appliances, new roof, new water heater, new flooring, new exterior paint for a total of cost $35,000 approximately in improvements. Attention to detail in all aspects. Location! Location! Location! This lovely home takes a few minutes walk to 3 award winning Poway schools (Deer Canyon Elementary, Mesa Verde Middle School, Westview High School). Quiet Cul-De-Sac Crestmont neighborhood, Short distance drive to Rancho Family YMCA, PQ plaza and 56 freeway, Low HOA and No Mello Roos. Well maintained engineered hardwood floors, Upgraded Granite counter tops and range hood, Farmers garden full of vegetables and flowers. Beautiful Single-Level Pool Home with awesome VIEWS of the valley located in a private gated neighborhood in the golf course community of Hidden Meadows. The home is on 2.5 acres with lots of fruit trees and also 4 Avacado trees.The pool/spa has a waterfall, Lots of room for entertaining. Formal Living and Dining room with separate Family Room. Large open kitchen with island. Large bedrooms, one with built in office, Master with walk-in closet, built-in Vanity & sun deck. House has Lots of Sky Lights. Upon entering you are warmly welcomed by an open floor plan, gorgeous flooring, recessed lighting, plantation shutters and living spaces bathed in natural light. The living room, dining area and kitchen flow seamlessly together for ease of daily living. An enclosed patio off the dining area allows year-round enjoyment of the idyllic San Diego weather. Click on the Virtual Tour to view a floorplan of the home and 360 degree photos. This gorgeous, executive home is located in the highly sought after The Trails at Fox Run community and awaits your arrival today. Impeccably lush and beautiful landscaping lines the pathways that guide you home in this safe and private neighborhood of South Clairemont. This amazing community is centrally located near schools, parks, restaurants and stores, once you are home you will not feel the need to venture far. Gorgeous remodel centrally located between 3 of metro’s hottest neighborhoods. The home sits on a corner lot and has been upgraded w/ modern amenities & stylish finishes while maintaining the character of the original hardwood floors.This two bedroom home features an open & inviting living room, breakfast nook & dining area that open to a state of the art kitchen.Upgraded lighting,shower surround & fashionable tile floors are just a few of the upgrades the bathroom features. New carpet, new paint, new garage door, and 4 new built-ins for added storage. This beautiful 2-bed, 2-bath SINGLE-STORY home features soaring vaulted ceilings, expanded atrium, plantation shutters, huge wrap around patio, large open living area, inside laundry room, A/C, 2-car garage. Extra wide side yard with new vinyl fence. Rear gate provides easy access to clubhouse and 1st tee. Canteridge at Harmony Grove Village is an all new master planned community that blends a rural landscape with modern design sensibility. Enjoy multi-use trails, picturesque parks and an equestrian area. Resort-style amenities include The Grove Recreation Area with swimming pool, spa, wading pool and splash pad plus BBQ areas, shade structures and playground. In addition, the 4th of July Park is a village hallmark offering dedicated space for outdoor concerts, balls games and celebratory events. Beautifully maintained 3 bedroom (plus optional bedroom) home in Rancho Santalina. 2 car attached garage with driveway. Stunning ocean and mountain views. Raised lot allows nice breeze to flow through the house. Large upstairs loft is great for an office or game room. Open kitchen with pantry and lots of storage and walk-in closets. Private low maintenance yard for entertaining. Playground for kids and picnic tables for parties. Walking/biking trails around the homes. Great location and excellent schools. Beautiful corner lot located in private gated community of San Marcos! 4 bedrooms, 3 baths, and upgrades throughout including brand new carpet and water proof vinyl flooring! Enjoy the spectacular views the backyard provides with built in BBQ, refrigerator, and bar area! Perfect for any family and conveniently located just minutes from shopping, restaurants, schools and CA78! Large corner unit – quiet location in complex. Open spacious tri-level floorplan with upper level loft/bonus area & oversized attached 2 car garage. Formal living & dining rooms. Fireplace in family room. Upgraded kitchen & baths, wood flooring, central air replaced 2015, water heater replaced 2017, added recessed lighting to family & bedrooms. Lower garage level features mud room for additional storage. Beautifully maintained complex w/community pool & spa nearby. Ample street parking. You’ll love the gorgeous canyon views from this single story 2 bedroom 1.5 bath condo in the desirable Glenwood Springs Complex in Scripps Ranch. The property has 2 private patios, a bright and spacious living area with gas fireplace, plantation shutters throughout, laundry in the unit, attached 2 car garage and many updates. The peaceful complex includes a swimming pool, jacuzzi, tennis courts, clubhouse, guest parking and beautiful landscaping with plenty of walking paths. Located near Lake Miramar. Trust sale with great potential. Kitchen, Dining and Family/Living room can all be part of a great room with relatively small adjustments. Sunny yard perfect for child play and entertaining. Sheds in the yard are very useful for gardening tools or toys. Covered porch adds an ample living space for multiple activities. Solar system practically pre-paid. Buyer to contact Solar company directly for plan details and balance of either cost or pre-paid usage. Single level 2 bed, 2 bath luxury town home in the coveted & centrally located Collage community in Carmel Mountain Ranch. Features an open layout that lives like a single family home, this end unit has a direct access two car garage, indoor laundry nook and a large patio off the living & master bedroom with peaceful views. The kitchen boasts high end stainless appliances, LED lighting, Dacor oven/gas range & Bosch dishwasher. Updated thermostat & bathrooms. In the Poway Unified School District. Upgraded and move in ready! Beautiful remodel w all new flooring, designer baseboards, new soft close cabinets, quartz counters, new SS appliances, updated lighting & more. Fresh neutral paint inside and out! Open floorplan with vaulted ceilings in living room and master bedroom. Enjoy the huge family room which is a permitted addition overloooking the spacious yard with fruit trees, room for kids to play and entertaining family or friends. Detached workshop/hobby or bedroom. Great opportunity in University Heights. 2 bed / 2 bath condo is upgraded throughout, with remodeled bathrooms, new kitchen countertops and sink, new paint, and beautiful bamboo floors. Enjoy a recently installed A/C, vaulted ceilings and in-unit washer/dryer. As a bonus, the HOA includes ultra high-speed internet with quiet and friendly neighbors in gated community. Walk to everything as you are close to restaurants, coffee shops, shopping and more. Beautifully renovated Balboa Park View Condo on Cortez Hill in Downtown. 2 Bedroom, 2 Full baths, open kitchen to living/dining room with fireplace and indoor laundry. Completely renovated, like NEW. NEW flooring, NEW cabinets, NEW granite couter tops, NEW stainless steel appliances, NEW carpet, NEW lighting fixtures, NEW vanities and so much more. Gated condo complex with rooftop spa and deck with beautiful views. Underground parking. Walking distance to Gaslamp, Petco Park and Bay. Premium corner unit in the East Village located in sought after Park Blvd West! This spacious home features a westward facing location, with courtyard & city views. The kitchen sports upgraded sleek shaker style cabinets, slab granite counters & a suite of stainless appliances. Wood floors are complimented with stone tile & carpet. Low HOA dues, large private balcony, 1 assigned parking space, 2 guest permits & additional storage options. Walkable to everything that Downtown has to offer! This home has been given new life! Now it is just waiting for you to put your finishing touches on it and make it your own! Nestled in a wonderful, conveniently located community and now new roof, all new kitchen appliances, flooring, lighting added, new counter tops in kitchen and bathrooms, new sinks and a bonus room! Large covered patio adds even more square footage. A new retaining wall has been added to the back yard and it is a blank canvas awaiting you to make it fit your lifestyle! ENJOY RESORT LIVING in sought after 5+ community of Vista Del Mar where you OWN THE LAND. Newly remodeled & immaculate mfg home w/fresh paint, brand new flooring, & upgrades throughout. Lovely 2 bed/2 bath, plus bonus room/office boasts open floorplan offers spacious family room with fireplace, dining room & kitchen with fresh cabinetry & eat-at bar. Large Master Suite with shower and tub. Oversized 2 car garage and driveway. Private yard perfect for relaxing and gardening. Close to all! END UNIT hilltop location w/ view to Ocean. NO Age Restrictions! Highly upgraded, move-in ready RARE SINGLE STORY. A fabulous private retreat! Shutters, Solatubes, Granite counters/vanities; full-wall tiled bath/showers. Newer front load W/D inside. New Water Heater & HVAC installed 2016. Dual Pane Vinyl windows throughout. Recessed lighting. Textured walls & ceiling; wood tile flooring. Patio in front and in back. 1 car finished Garage + 1 car Parking in attached drive. Pool/Spa in complex. This Valley Oaks Mobile Home Community ticks all the boxes, pride of ownership, updated kitchen and open floor plan. This home is a must see for anyone seeking their first ready to move in starter home. The 1,584 square feet of living space offers room for a small family with 3 bedrooms and 2 full bathrooms. The open living area allows plenty of natural light to fill the home and create a bright, welcoming space the whole family can enjoy. The updated kitchen features modern designer cabinets. March’s San Diego real estate market in review: As of March 2018, the median detached home in San Diego County sold for $619,000 up 7.7% from the previous year. 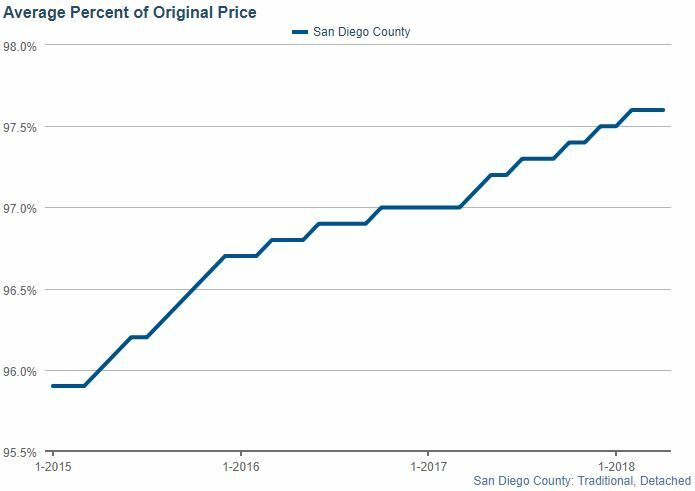 As of March 2018, the median attached home (including condos, townhomes, and twinhomes in San Diego County sold for $406,000, up 6.8% from last year. 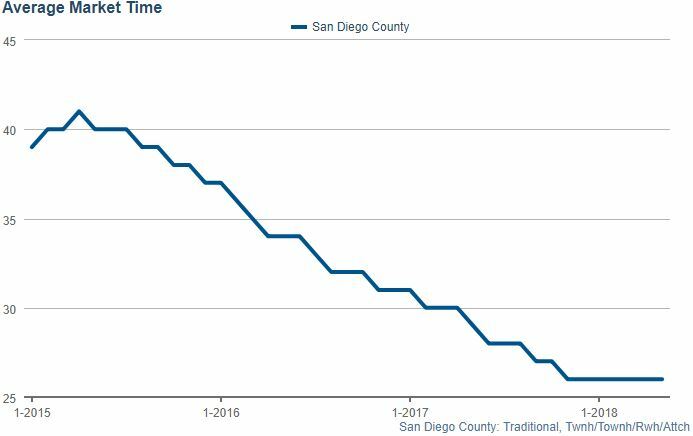 The average detached home in San Diego spent 33 days on the market. As of March 2018, the average seller of a detached home in San Diego County receives 97.6% of the original list price at the close of the sale. As of March 2018, the owners of attached properties (condos, twinhomes, and townhomes) retained 98.6% of the original list price. Extensive design reflects owners care and interest in this special single level property. Complete privacy and gorgeous city to ocean views. One of the longest private drives in La Jolla leads you to this magical setting on nearly a half acre lot. Sold for $1,800,000. Custom luxury renovation in University Heights w/ 15ft ceilings. Impeccable modern design and fixtures! Stunning kitchen w/ ambient cabinet lighting, black Nero Mist stone custom island w/waterfall edges opening to LR/DR. Fireplace w/ floor to ceiling Nero Marquina black marble tile. Large master suite w/vaulted ceiling, huge walk-in closet, French doors open to custom patio and beautifully manicured private fenced yard. Spa-like bathroom w/oversized shower, ceiling to cabinet backsplash, sleek tile, and more. West of the 5, this single-level coastal masterpiece has been completely remodeled with ultra-stylish, cool-tone finishes throughout, state-of-the-art appliances, a wood burning fireplace & an open dining area with views of the glistening Pacific Ocean. La Cantina doors open to an oversized patio to make entertaining a breeze. Large lot offers tons of space for kids, pets and gardening. Gated, secluded entry features plenty of parking. This one-of-a-kind home is minutes from all downtown Encinitas offers. Sold for $1,700,000. This stunning 5 bedroom 4 full bathroom upgraded home has it all! Spacious upgraded kitchen, dining and family room. First floor bedroom and full bathroom. Four bedrooms upstairs all connected to full bathrooms. Oversized backyard is an entertainer’s delight with gas fire pit, built in outdoor kitchen with BBQ island, fridge and sink. Family friendly double ended cul-de-sac with the award winning Dingeman Elementary just down the hill. Close to parks, shopping, dining and easy freeway access. Sold for $1,085,000. Highly upgraded Single level open concept home just completed and move-in ready! This 4 Bed, 3.5 Bath, 3 Car garage home features a Grand Great Room with separate Living and Dining areas. Ultimate cooks kitchen to impress the most discriminating foodies and entertain everyone with a oversized quartz island. Master Suite features Spa like bath and private retreat. Spacious Secondary Master Suite. Indoor/Door Living is seamless with Covered outdoor patio with fireplace! Sold for $950,000. Beautiful VIEW home West of El Camino Real with no neighbor behind. Great cul-de-sac location. Over $125K Upgrades include custom remodeled gourmet kitchen and master bath, hickory wood flooring, outdoor gas BBQ/granite counter, plantation shutters, EV charging in garage. New high efficiency AC/Heater. Yard fountain/fire pit. Home is a dream with great location and convenient to local schools, shops and highway access. This wonderfully remodeled home offers 2,488 sqft of living space, great natural light, and TWO master suites! Enjoy a formal living room, plus a family room which flows seamlessly with the dining area and updated kitchen. Perfect for entertaining and valued family time, you will feel at home the moment you enter. Offering a raised lot, plus a fantastic location on the corner of a quiet cul-de-sac! Sold for $805,000. Located in the wonderful Walnut Hills gated community on culdesac lot. This beautifully renovated home features designer finishes & details. New kitchen w/breakfast nook, bar seating, island & quartz counters. Great floor plan w/vaulted ceilings, plantation shutters, interior laundry room, 3 car garage & 4 BR’s. Family room opens to kitchen w/stone fireplace. Master suite w/soaking tub & shower. Updates: new windows, interior doors, paint & finishes. Wonderful large back/side, patios, fruit trees & yard. Enjoy this warm and inviting open-concept floor plan! Generous Living Room w/wood burning fire place, spacious kitchen w/ granite tile countertops, 4 bedrooms, and 2 remodeled bathrooms! Beautiful backyard space with native plants and large patio! Centrally located in the beautiful Mira Mesa area! Minutes away from schools, parks, restaurants, shopping and the I15! Sold for $615,000. The highly sought-after Savannah Terrace Community is in a great location, just a few quick minutes away from shopping, I15 and SR56 freeways. Multiple amenities available to residents such as a fitness center, swimming pool, tennis, basketball, and racquetball courts, library, barbecue/picnic areas, media room, and concierge club living. Eligible for the award-winning Poway Unified School District! Don’t miss this open floor plan, attached 2 car garage, and contemporary kitchen! Sold for $572,250. Amazing location 5 min away from the beach and from the Camp Pendleton gate (VA approved!)! This beautiful townhouse is located in a gated community and has 3 BR and each bedroom has its own bathroom in it, plus a powder room on the main living spaces! Enjoy the ocean views from the master bedroom and family room, the open concept kitchen, stainless steel appliances and the cozy fireplace! Laundry onsite & an attached 2-car garage. The HOA has a pool/spa, playground, pull-up bars, and a BBQ area! Beautiful turnkey home has soaring 17′ ceilings as you enter this optional 5 bedroom, 3 bath home. Recent updates include a white kitchen with granite counter-tops, SS appliances, new wood laminate & carpeting. GORGEOUS master bathroom. The home has central AC, a water softener system, plantation shutters, Nest & Smart Water Rain Machine technology, epoxy garage floor, built-ins and a large backyard great for entertaining and kids. Just a few homes away from the community pool. Great Oak HS. Desirable 2 bedroom unit in complex with 2 car attached garage! Backs to open space with park-like & mountain views. Updated kitchen & baths, wood tile flooring downstairs, ceiling fans & central air (2 years new). Open spacious floor plan w/living room fireplace, downstairs powder room and 2 large bedrooms upstairs. Located in award winning Poway School Unified School District. Short distance to freeway, schools, parks and neighborhood shopping w/restaurants, entertainment and stores! Step into this beautifully remodeled 3 bedroom 2 bathroom home nestled in the highly desirable neighborhood of Oceanside Manor. Enjoy the peace and quiet of this spectacular community which features tennis courts, a community pool and club house, and rec area. Inside the home you will find vaulted ceilings, updated flooring, and tons of natural light pouring in. Chanel your inner chef in your new spacious kitchen that features an over-the-sink window, refinished counters and recessed lighting. Sold for $449,000. Beautiful Santaluz Home on a quite street w/ a massive yard. Arguably the most desired floor plan by Davidson Homes, this plan 1 offers an open & bright design, ideal for both entertaining & family livability. Offering a modern white kitchen that is central to the family rm, formal living & dining & steps to the ultra private rear yard, this home has it all. Oversized Master retreat on the main level, central courtyard w/ fireplace, office, & 3 bedrooms suites. Price to sell fast. 3D Floorplan + VT a must. Sold for $1,490,000. Single-Story living in executive gated community of Santa Monica adjacent to Rancho Santa Fe and Santaluz! This former model is situated at the end of a cul-de-sac with no neighbor behind for wonderful privacy. The large open floor plan offers single-story living w all bedrooms on the main floor, an expansive master suite & upstairs private retreat. Convenient central location close to freeways, schools, parks, shopping & minutes to world class beaches! Community pool/spa/tennis & more! Top PUSD schools. Sold for $1,350,000. Exceptional property in the coveted neighborhood of the Heights. Large corner lot on a fantastic cul-de-sac street, boasting peek ocean views. Enjoy watching sunsets in the ultimate entertainer’s backyard complete with outdoor BBQ/kitchen island plus exquisite landscaping, fire pit and citrus trees. Beautiful flooring, updated kitchen, 3-car garage, 4 Bedrooms, 2.5 Baths, all meticulously maintained! No Mello Roos and extremely low HOA fee. A rare and special opportunity. Will go quickly! Sold for $1,323,000. Ideally located within walking distance to award winning K-12 public schools, Carmel Creek Park, restaurants, shops, movies and more. Corner lot offers an abundance of natural light, a feeling of open space and a view of Carmel Creek Park. The home features soaring ceilings, open family room to kitchen, bonus office or game room with built-ins, crown molding, all new paint and 2 fireplaces. The spacious kitchen …See Supplement. Sold for $1,120,000. Only 6 months old Casabella Plan 2 w/ beautiful upgrades! Gorgeous hardwood flooring, gourmet kitchen w/ white shaker cabinets, full back-splash, upgraded pulls and knobs, farmers apron sink, Bosch s/s appliances w/ indoor & covered outdoor dining spaces plus custom solar shade! Spacious 3 bd plus loft (bd/ba down) & stunning master bedroom and bath. 3 car tandem garage w/epoxy flooring & built in cabinets. Meticulously landscaped w/ west views! Wow! Sold for $1,098,000. WOW! DON’T MISS THIS ONE! RARELY AVAILABLE, single-story home in highly desirable LA COSTA VALLEY! This 4BD/2.5BA home features a bright & open floor plan, plantation shutters, custom paint, maple cabinets, and much more! Bamboo flooring in living room and master. The lush backyard includes plenty of space for entertaining and wonderful privacy. Enjoy all of the amenities this resort-like community has to offer, including community pool, tennis courts, rec room, workout room, trails & TOP RANKED SCHOOLS! Sold for $1,055,000. Charming Park Village remodel w/open floor plan, light & bright! Upgraded kitchen w/granite counters & tumblestone backsplash, newer SS appliances. Decorator paint colors, hardwood floors and neutral carpets throughout. Upgraded master bath w/ quartz counters, new fixtures & separate tub & updated shower w/frameless enclosure. Central AC & ceiling fans. Enjoy gathering at backyard firepit. Great cul de sac location, walk to PV Elem, nearby park & canyon. No HOA & low Mello Roos soon to expire. Top PUSD! Sold for $965,000. Beautiful single story home on corner lot 4 bedroom 2 bath with NO HOA or mello roos, courtyard style entry, 2 car attached garage, pool-side fenced backyard lot, plenty of storage closets, front and back yard low maintenance landscaping, great floor plan with living room, family room and formal dining room, fireplace in the living room, located in the highly sought after neighborhood in Encinitas Community, award winning schools, parks, shopping, beach, and quick access to fwys. Sold for $925,000. Rare find in convenient low traffic area of Bay Park! Lovely remodeled home sits high above the Bay for wonderful ocean breezes and moderate temperatures all year long. With over 7,700 sf lot, there is plenty of room for kids to play and growing families to enlarge this lovely home, add a pool, casita, or workshop. Features bright open floorplan with high ceilings and complete interior remodel! Incredible central location with easy access to freeways, downtown, beaches, shopping & schools/colleges. No HOA. Sold for $916,000. Stunning home loaded with luxurious features and charm, ideally located in the community of Rancho Dorado. Open floorplan boasts formal living room w/ custom French Doors, remodeled Gourmet Chef kitchen w/professional grade stainless appls, custom stainless steel tile backsplash, eat-at center island & large walk-in pantry. Master bedroom w/ retreat & bathroom w/dual sinks/vanities,claw tub, & walk-in closet. Large lot offers lush mature landscaping, large grass areas, water feature, & spacious patio. Sold for $910,000. Great floor plan! Large kitchen to entertain friends and family that leads to a family warm with cozy fireplace. Oversided bonus room upstairs that could easily convert to a home office or kids playroom. Large master suite with spacious walk-in closets, elongated oval soaking tub. Dual zones on A/C. Family friendly park and walking trails adjacent. Part of the Poway Unified School District. Sold for $890,000. Charming Bay Park 5bd/3bth with Tons of Curb Appeal! Priced to Sell! Wonderfully Maintained by the Original Owner! Amazing Location Tucked Away on a Quiet Cul-De-Sac Street and is within Walking Distance to Western Hills Park. This Bay Park home has tons of space for a growing family. It has a large eat-in kitchen, new dual pane windows, and the exterior was recently painted. Come See This Gorgeous Home Before Its Gone! Beautiful renovated unit with floor to ceiling glass sliding doors and large deck with great ocean views. Updated open kitchen with stainless steel appliances, hardwood flooring in all living spaces and brand new carpeting in bedrooms. Master bedroom has large walk-in closet, contemporary vanities and beautiful ocean and sunset views. Two parking spaces in garage. Amenities include tennis courts, pool, spa, sauna, exercise room, club house & guest suites available for owners guests for a small fee. Sold for $860,000. Don’t miss this stunning home in desirable Del Sur community. It presents a wide-open floor plan with wood floors, custom window treatments, built-in cabinets, S/S appliances, kitchen island, granite countertops, backsplash, wrought iron stair rails, etc. Lovely courtyard with fire pit and custom pavers. Accessible to 14 parks and 11 pools. Poway Unified schools, near Del Sur Town Center, 4S Commons, Target, Sprouts, restaurants, fitness center & more. Sold for $830,000. TRANQUIL & PRIVATE SINGLE STORY WITH PANORAMIC VIEWS!!! Your own little peace of heaven nestled in the gated community of Candlelight Hills! No details overlooked & displays amazing pride of ownership. Highlights include stunning views from inside & out, flowing open floor plan, fully owned solar electric, stylish upgrades through out, lovely landscaping, a variety of fruit trees & much more! Expansive entertainers yard w/ sparkling pool & spa, lush landscaping & no neighbors behind! See supp for more! Sold for $830,000. Located in the wonderful Walnut Hills gated community on culdesac lot. This beautifully renovated home features designer finishes & details. New kitchen w/breakfast nook, bar seating, island & quartz counters. Great floor plan w/vaulted ceilings, plantation shutters, interior laundry room, 3 car garage & 4 BR’s. Family room opens to kitchen w/stone fireplace. Master suite w/soaking tub & shower. Updates: new windows, interior doors, paint & finishes. Wonderful large back/side, patios, fruit trees & yard. A true gem! Sold for $720,000. Remodeled with panoramic mtn & golf course views. Kitchen remodeled with expanded cherry cabinets & quartz countertops including custom computer desk & LED recessed lights. Mstr BA has newer countertops & lights & newer shower & toilet. Guest BA has new cabinets, countertops & lights; Bathtub replaced with walk-in shower. Living room has high ceilings & newer fireplace frontage. Mstr BR has ceiling fan/light & sliding glass door to backyd. 2nd BR has direct access to bathroom. Dual pane windows. Sold for $685,000. Location, location, location! Living in the finest resort style gated community in La Jolla. Rare third floor unit with beautiful pool view in the center of Regents La Jolla community. All windows face to east you will enjoy morning to afternoon sunlight, quiet, no other building block your view. two parallel underground parking right beside elevator. white marble floor in the kitchen and bath rooms. Enjoy the convenience with walking distances to shops, restaurants, JCC, and new camps trolley stop. Sold for $643,000. GREAT Single Story Detached Home in Highly Desirable Westwood neighborhood. Vaulted ceiling. Open kitchen layout. Extra spacious living space along entire back of the house. (not included in square footage) Convenient location. Hiking trails, bike trails and foot bridge within walking distance at Lake Hodges and RB Community Park. Westwood Club includes olympic size pool, tennis courts, exercise facilities, and more. Easy freeway access. Award Winning Poway Unified School District. Sold for $621,000. This Scripps Ranch townhome has been completely remodeled from top to bottom including brand new kitchen with granite counters and stainless steel appliances, new windows, flooring, paint, recessed lighting, beautifully redone bathrooms, brand new central heat, high-efficiency AC, and so much more! Plus oversized, fenced patio with amazing sunset views and privacy! Very close to restaurants, shopping, top-rated Scripps Ranch schools, and more! Sold for $620,000. Sleek and modern detached home located in the secure, gated community of Belmont! Upgrades include Stainless Steel appliances and new flooring throughout the home. Fresh paint in master, carpet in all bedrooms and new tile flooring in bathrooms. New Turf grass in the backyard with custom built wood and paver patio. Tankless water heater and large washer & dryer! Community amenities include bbq, pool & spa! San Marcos Unified School District – Zoned for Double Peak K8 School. Sold for $618,000. Ideal family home in exclusive gated community of Belleza… Loaded with upgrades and unique features this well appointed home boasts gourmet kitchen w/ granite counters, center island, & breakfast area w/views of lush backyard and hillside. Family room offers rich wood flooring, fireplace, media niche & built-in surround sound. The master suite has dual sinks/vanities, spa tub, separate glass enclosed shower, & walk-in closet. Other features include private backyard, Security System, AC & 2 car garage. Sold for $610,000. Single level located at end of cul-de-sac location. Spacious backyard. Walking distance to park and Rolling Hills Elementary School. Charming upgraded townhome in highly desirable Tamarack Point! Open flowing floor plan with vaulted ceilings & dual master suites. Spacious remodeled kitchen and baths. Enjoy entertaining on one of the two private patios both with views of the greenbelt. Large tandem 2 car attached garage with side by side laundry area & 1 additional space. This resort like complex has a refreshing pool/spa, tennis courts, playground & off site RV parking. Carlsbad schools & minutes to parks, trails, beaches. Low fees. Sold for $535,000. Charming single story home in beautiful Cardiff by the Sea! This light and bright 2 bedroom, 1 bath shows true pride of ownership. Granite counter tops, fresh paint, newly tiled bath, new dishwasher, newer flooring throughout, private patio perfect for entertaining all year round, and much more. Enjoy the community pool, 25-acre canyon park with walking trails, award winning Cardiff Schools, and all that the Cardiff lifestyle has to offer living just a few minutes from the beach! VA buyers welcome! Sold for $532,000. Great location in Shadowridge on golf course and beautifully remodeled. Improvements include new flooring, fresh paint, new counter tops in kitchen and stainless steel appliances. Exterior is well maintained with a nice entry courtyard and a large patio overlooks the golf course. Large two car garage with washer and dryer Single story and low maintenance makes this a desirable 2 Bed 2 bath. HOA includes pool and spa. Sold for $461,000. February’s San Diego real estate market in review: As of February 2018, the median detached home in San Diego County sold for $618,000, up 8.8% from the previous year. As of February 2018, the median attached home (including condos, townhomes, and twinhomes in San Diego County sold for $405,000, up 7.1% from last year. As of February 2018, the average seller of a detached home in San Diego County receives 97.6% of the original list price at the close of the sale. As of February 2018, the owners of attached properties (condos, twinhomes, and townhomes) retained 98.6% of the original list price.